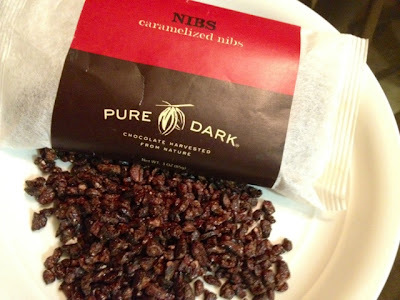 I found these Pure Dark Caramelized Nibs at the grocery store last night in Palm Springs, CA with high hopes. I'm on a girls weekend in Palm Springs, CA with friends that date back all the way to high school. Although I brought plenty of chocolate to demonstrate the flavor difference between fine chocolate and bulk chocolate, they saw these and were curious. I'm secretly attempting to turn them all into lovers of fine chocolate before the weekend is over. Unfortunately, this product is not going to help...or maybe it will. Some of the girls spit out the caramelized nibs instead of swallowing. Others finished their mouthful then threw away the remaining nibs they were holding. That should be enough of a review to let you know what you are in for. The aroma eludes to a bit of chocolate but mostly is sugar. Reasonable since these are caramelized. Although the nibs do have a nice crunch, there is very little cocoa flavor. The overwhelming flavor is charred and burned, both chocolate and sugar. Shame on me for not reading the label before I purchased. This is a great example of a large company who is trying to look like a small craft chocolate company, but the product tells the whole story. These will go a long ways towards demonstrating the difference between fine and bulk chocolate. Now I need to find some great nibs in Palm Springs. Pure Dark is actually owned by Mars. They are transitioning Pure Dark sales to their direct sales distribution via Dove Discoveries. First, thank you for the response! Shame on me, I didn't read the label before I purchased. I saw the Mars name after I left the store. I still may have purchased it if I had seen the Mars name before I bought however I wouldn't have had such high expectations. I sure wish that they had better quality control. These give nibs a bad name and I HATE to give a bad review of chocolate.